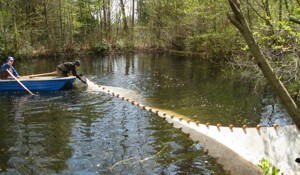 This page describes the stickleback system and the facilities we have available for research. The sidebar links to lab and field procedures for working with threespine stickleback. The three-spined stickleback (Gasterosteus aculeatus complex) is a small fish common in many temperate coastal marine and fresh waters of the northern hemisphere. Niko Tinbergen’s studies of the behavior of this fish were important to the development of the field of ethology. It now has a fully sequenced genome and has become a model vertebrate for studies in the fields of animal behavior, evolution, genetics, and toxicology. The photo above shows a male of the benthic species from Paxton Lake, Texada Island, BC. He is guarding a family of stickleback fry that hatched a few days previously. 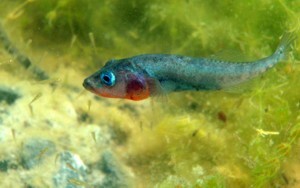 The threespine stickleback species complex reaches the height of its diversity in lakes and streams of British Columbia. The populations occurring here include some of the youngest species of organisms on earth. Most water bodies contain only a single stickleback species, but pairs of species have evolved independently in a few small lakes that are less than 12000 years old. The system has wonderful properties that allow us to address very basic questions concerning the roles of resources, species interactions, phenotypic plasticity, sexual selection and other factors in the evolution of diversity. Distinct populations and species produce viable and fertile hybrids, making it possible to investigate the genetic basis of species differences. Our wet lab consists of two air-conditioned rooms in the new InSEAS aquatic facility (one with stand-alone aquariums and the other with a flow-though aquarium system), plus controlled-temperature environment chambers. 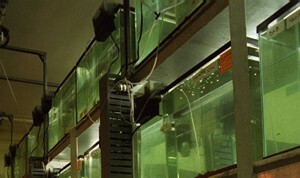 These facilities contain hundreds of aquariums that currently mainly house stickleback. This facility was completed in 2008. 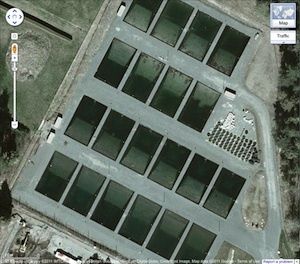 It includes 20 ponds, each 25 m x 15 m. An aerial view is seen below. Click the image below to see a larger view in Google Maps. Each pond contains a shallow littoral area at one end and a 6 m deep end. The littoral area contains a layer of sand and limestone gravel extracted from surface mines near Paxton Lake, Texada Island. The ponds have been seeded with plants and invertebrates from Paxton Lake, an 11-ha lake containing a benthic-limnetic stickleback species pair. Apart from their construction and initialization, the ponds are unmanipulated environments. We use them to carry out experiments on adaptation, natural selection, and genetic mapping of natural variation in behavior and other traits. 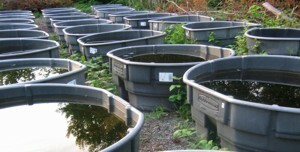 The new experimental pond facility includes 80 plastic rubbermaid barrels, each 2 m in diameter, for experimental studies of aquatic organisms. This outdoor facility is no more and has been replaced by the new experimental ponds. It too was located on the South Campus of the University of British Columbia. The site contained 13 ponds. Each pond was 23 x 23 m2 with a bottom that sloped gradually from 0 m at the edges to 3 m deep in the center. The ponds were constructed in 1991 and seeded with plants and invertebrates from Paxton Lake, an 11-ha lake containing a benthic and limnetic stickleback species pair. 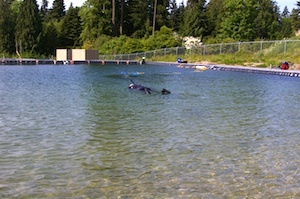 The ponds were lined with polyethylene overlaid with 0.25 m of sand, and were bordered with limestone extracted from surface mines near Paxton Lake. Apart from their construction, initialization, and use in prior experiments, the ponds were unmanipulated environments.